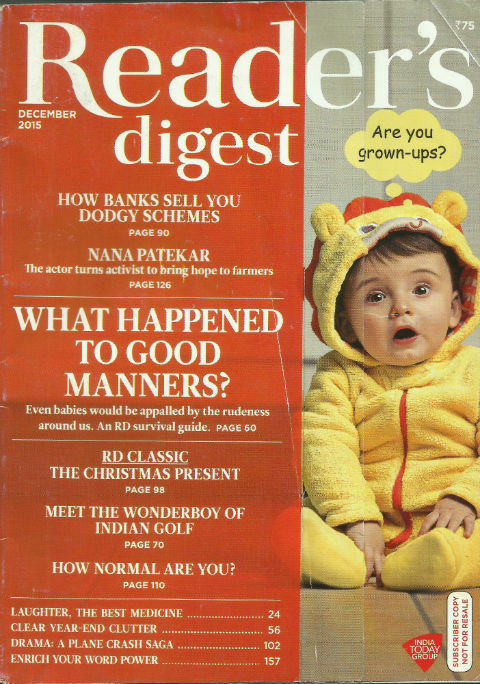 The last issue of Reader’s Digest magazine (India Edition) for the year 2015 was published on time. Our subscribers copy reached us a little late. Here are our Views and Reviews for the same. The orange red background with white and yellow content makes the cover page quite attractive. The photo of a kid on the cover page is effective too. We consider the editorial as one of the important sections of any media. It sets up a bridge between the editor and the readers. It gives the editor an opportunity to link to the readers, and convey his/her views and vision behind various segments of the issue. Often it contains editor’s views about important happenings in surrounding too. This is the first editorial of Sanghamitra (the new editor who replaced retired editor Mohan Sivanand), we got to read (the subscriber copy of Nov 2015 issue of Reader’s Digest didn’t reach us). It is written in interesting manner. And yes, she talks about manners and etiquette in the same. We ourselves believe in being responsible citizen of the Earth, because it is civilization which makes us different than other species. An article titled Why I Study Memory by Wendy Suzuki is an emotional account of real life incidents from her life. It is worth to note that she is a Professor of Neural Science and Psychology in the Center for Neural Science at New York University. If you want to know more about her, you can visit http://suzukilab.com. The writing style is quite smooth and you will understand that, at the end of the day, we human beings are emotional animals and we need to feel that there are people who loves us. Megan Jones’ article got a fantastic title, which is effective enough to catch our attention. When the stakes are low, it is easy to say sorry. But of course, we know when be bump into some unknown fellow we can easily utter the word “sorry”. But when there is a loved one there it is often the harder (if not hardest) word to say. Despite of knowing that we are wrong, we will try finding excuses and justify the actions. The article falls in the Art of Living section, and is worth reading for sure. The article was originally published in July 2015 issue of its Canada edition and is available to read here. Reframing loses – is another (very small) article which talks about emotional stuff and you may like to read it. Samit Basu’s article What happened to good manners (with coauthors Mamta and Genesia) is quite detailed. It talks about anger management in a way. Of course it is focused on etiquette. Often the important thing is how you represent your point. And yes, we have to behave with other in the way, we like them to behave with us. Want to get inspired? Read the story of Shubham Jaglan from this issue. Money is one of the very important aspect of life. We often try to save by cutting expenses where possible. It is in our tradition. However sometimes we feel cheated when our hard earned money is invested in a scheme which doesn’t perform the way we have expected. RBI and other such regulatory agencies do warn people to read many things quite carefully. However we often tend to skip even the “disclaimer and risk factors” written in very small letters when we fill in application forms. The article in the Money segment is a not-to-miss one. The – RD Classic – segment brings in a story about Christmas by James Michener. A small and interesting tale. We often hear the phrase “Truth is stranger than the fiction”. When we read various incidents in Real Life Drama segment in various issues of Reader’s Digest; we are reinforced to remember it. The incident discussed in this issue is authored by Conor Mihell and titled as Into The Rock. Survival look almost impossible for the people inside, when a plane was crashed. The pilot himself call it a miracle that he survived. Telling more will reveal the entire incident, so we leave it for you to explore. Jane Rosett from New York Times come up with a tale named “Starting Over” in “My Story” segment. Small but interesting article. There are people who complain about the system and how it is malfunctioning or even not functioning. Making an issue of something is different than raising awareness. And genuinely working towards finding and implementing a solution for any situation is more important than just raising awareness. Bollywood actor, Nana Patekar, who is known for some of his remarkable performances, is a genuine human being at the heart. His honest efforts to support the farmers who caught in bad circumstances due to draught like situations are taken note of by many mainstream media as well. Read more about his work at Naam Foundation article (Wikipedia). In this issue there is an article authored by Radha Rajadhyaksha talking about Nana’s genuine efforts in the arena. It is worth reading. See, you will always find news about something wrong happening in the society in almost every media element; however there are only few of them represent the inspirational and positive stufs of the society. So you shouldn’t miss a chance to read it when available. Elin was born twice – is a bonus read of this issue, and it remains true to it (Bonus)! An emotional article talking about the power of love, determination and positive attitude. There are some other miscellaneous reading segments in the issue which are worth exploring in addition. Of course, a value for money issue which is worth going for. The positives explored are worth to read. It doesn’t only inform you about good stuffs, but inspire you do the same.